The M10 is a member of Pelican's Black Knight® Series, an innovative range of hi-tech flashlights for use by professionals. 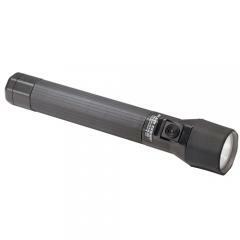 M10 Alkaline 4C is 11-1/4" (28.6 cm) in length and equipped with a handy on/off intermittent switch. The M10 is made of chemical resistant, unbreakable material with a thermo plastic rubber grip. The lens is made of a high temperature nylon lens protected by a thermoplastic rubber shroud. The sure grip sheath and head are made of thermoplastic rubber to resist chemicals and perspiration. Its bright pre-focused Xenon laser spot beam penetrates fog and smoke. It also includes a safety battery tray with 4C cell alkaline batteries (not included) in order to avoid accidents in case that cells are inverted. It is water resistant (not for diving applications).